Domesday Book contains mention of a church in Gringley-on-the-Hill, but there is no other evidence today of anything from that date. 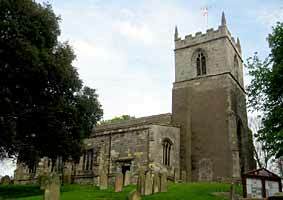 The church today is in stone, consisting of a chancel, nave, north and south aisles and an embattled western tower with four pinnacles and six bells. Two bells were added to the original four in 2002. The oldest bell was cast by Robert Mellors in 1520. The earliest feature is a Norman blocked doorway on the north side of the tower. The north arcade of 3 arches has tall circular shafts with simple moulded capitals, in Early English style. Otherwise the church is mainly Perpendicular, especially the upper part of the tower. An exception is the remarkable pillar piscina in the chancel, which is Early English. The south doorway is Decorated, the north door classical, probably late 17th Century. Prior to 1912 there were three Perpendicular clerestory windows on the south side, although the south aisle had gone. The church was restored and enlarged in 1912 at a cost of £3100, including the erection of a new south aisle and clergy vestry.